Now, we do like a nice headstock; solid, attractive and giving out that vibe that yes, this is a good guitar and I have good taste because I chose it. Some are very recognisable – think Fender or Gibson; some very plain – think Martin for example and some just wacky – think Jackson! But in all cases we guitarists do tend to look at the headstock and judge the player by what it says or looks like. If we see a guitar with an unknown makers’ name (which may be a custom build that cost mega bucks) do we all think: ‘can’t be any good and why aren’t they playing a Gibson, or Fender or …’? To me, I love Gibson headstocks – not the ‘cheap’ ones with the transfers on – but those with proper inlays, such as the diamond on a Custom, which you can see from the back of the hall is a Gibson. Snobbish? Yep. I also like some of the pointy headstocks you get on Ibanez type guitars as well as any classy looking, nicely shaped headstock with a distinctive and attractive inlay. Fender headstocks do nothing for me, although they are very recognisable, and neither do plain acoustic guitar heads. Guild – lovely; looks expensive and playable. Taylor – looks modern and well made. Gretsch – very distinctive. Epiphone – too long unless it is a custom short one with nice inlays. PRS – distinctive certainly. Knaggs – looks expensive (which it is). Looking at the images above, apart from Fender, the common theme seems to be black gloss or dark wood. A lot of the ‘custom’ makers (both acoustic and electric) lose out in my affections because their headstock is a bit bland and lacks presence, as does anything with a transfer on it – stick £20 on the price and give me an inlay! Some guitars sport some beautiful custom inlays that look like they took longer to make than the guitar, but boy, are they classy! 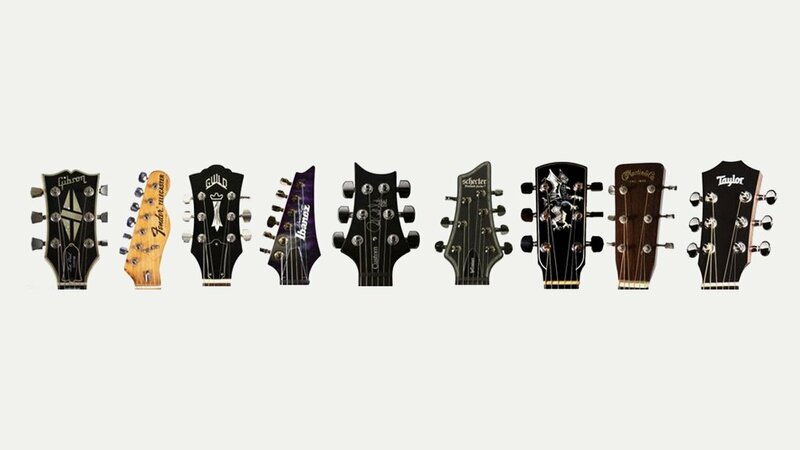 So what’s your favourite headstock?